The sprawling villas on both sides don’t point to a village. I’m about to double-back when the signboard declares that I’m still a kilometre away. The signs are all over the place – a book and strawberry, over the red type declaring Bhilar as India’s first “books village”. Located between the popular hill towns of Panchgani and Mahabaleshwar, the village is modeled on England’s Hay-on-Wye. The Welsh village, with as many as 40 second-hand bookstores and an annual literary festival, has become a prominent tourist destination over the years. The Maharashtra government harbours similar ambitions for this hamlet in Satara. As many as 25 artistically decorated locations around the village thus have been turned into reading spots. The first is Kadambari or the novel section, with rich hues of yellow and red, painted by artists from Thane. 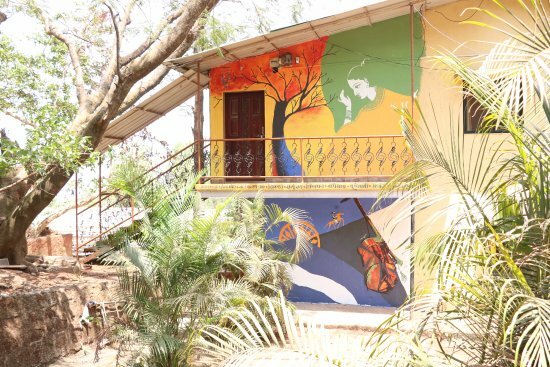 The murals at these houses reflect the books inside, which range from literature, poetry, religion, women and children, history, environment, folk literature to biographies. Where animals dot the white walls housing children’s books, caricatures, Warli art and even a makeshift fort and Maratha ruler Shivaji rule elsewhere. The art is a giveaway but spotting the houses is easy even otherwise, with sign boards pointing the way and a holistic map at the start. Inside, are the rotating book racks, green cupboards reminiscent of government offices, plastic chairs, and in some cases bean bags. Canvassing the landscape as the only outsider a hot summer day, some of the houses shut, their owners away. Within the two kilometre periphery, most doors are left open. Walking in feels like an intrusion, like stumbling on to a domestic scene, especially as the smell of prawn curry whiffs by. Then, the appetite to go through titles is suddenly lost, replaced by the urge to barge into the kitchen. In some, you might just get away with it. Not barging into the kitchen, but partaking homemade thalis and snacks. A small outpost at the beginning also has all the right words – thalipeeth, pitla bhaat (traditional besan preparation), poha. That’s not to say the village has not been corrupted by outside influence. Huge boards with Chinese items are more prominent than the ones selling thalis. At Kingberry farms, on the periphery, is the added option of a Gujarati thali. The influx from the neighbouring state must be rather huge, given that the state is planning to introduce Gujarati titles alongside English for the visitors. Bhilar’s literary genesis lies in the state department’s drive to promote Marathi. So all the titles, over 20,000 of them, are in the regional language. I strain to read a few pages but it’s not easy to read in a language left behind in school. After a while, I give up and turn to the Muriel Sparks I brought with me. It’s heartening to know that this is being remedied. From my spot, overlooking a strawberry field, pausing Miss Brodie’s classes, I see families come out and pick the ripe berries, before scuttling inside again. Strawberries are the main source of income in the village, with all houses bearing green patches, no matter the size. The roads are empty barring a few kids playing and the chickens walking past. The occasional chiming of the temple bells is the only other thing breaking the reverie. Incidentally, the temples also house some literature besides offering great views; the only other attraction here. Ahead, at the market square there is more activity. Crates are being filled to be exported, women are waiting for the sumo to take them to Panchgani. The wait, here, can run into hours, and the vehicle when it arrives, packs over 15 people onboard. Nobody is in a hurry, barring me, the only outsider observing the slow rhythm of village life. If I had more time, I would have tried my hands at more pages of Marathi literature. Passing college kids walking back home, with the sun about to set, I walk past the few hotels that Bhilar has to offer. The aforementioned villas and few houses too offer rooms for those who want to live the slow life. Here too the pronouncements are loud – “Bhilar, India’s first books village”. The boards notwithstanding, Bhilar has a long way to go before it can become an abode for book lovers. Meanwhile, it’s definitely an alternative to the tried and tested terrains of Panchgani. You won’t get the famed strawberry cream here, but with Mala’s and Mapro a stone’s throw away and Dhom lake to escape to in the evenings, it’s worth giving the village life a shot.